We present a list of the 50 states and their flowers; for more information, visit The United States National Arboretum. Since ancient times, civic leaders have used flowers and flower images as symbols of thriving communities. In fact, you might say flowers were an early form of advertising. And while there's no shortage of commercials in modern America, we still tap flowers for their unparalleled prowess in communication, with each state in the union proudly claiming an official state flower. State flowers are mostly a native flower which originated in the respective geographical zone. 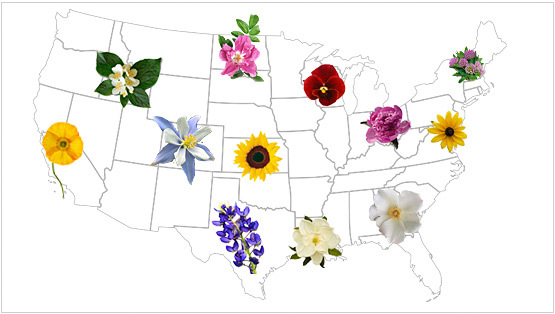 A guide to state flowers, from peony and prairie rose to poppy and pine. Alabama: Camellia. Native to Asia, camellias are known throughout the world for their elegance and grace. Alaska: Forget-me-not. This summer-blooming perennial makes a lasting impression. Arizona: Saguaro Cactus Blossom. Bursts of arresting beauty in a hot, dry climate. Arkansas: Apple Blossom. Its pale pink loveliness is synonymous with spring. Officially designated in 1901. California: California Poppy. The Golden State’s vivid symbol. Colorado: Rocky Mountain Columbine. School children chose this wildflower, which blooms in several pastel shades, in 1899. Connecticut: Mountain Laurel. This pink and white blossom has a lovely smell. Delaware: Peach Blossom. A natural choice for a grower of peach trees. Florida: Orange Blossom. Fresh, fragrant and very fitting for the Sunshine State. Georgia: Cherokee Rose. Officially designated in 1916. Hawaii: Hibiscus. A magnificent flower that evokes the tropics. Idaho: Mock Orange. This deciduous shrub produces a stunning white flower. Illinois: Purple Violet. The 1893 World’s Fair in Chicago spurred states to choose emblematic flowers. Illinois made the violet its official selection in 1908. Indiana: Peony. This luscious bloom has long been associated with prosperity. Iowa: Wild Prairie Rose. A rugged version of the regal favorite. Adopted in 1897. Kansas: Sunflower. One of the most iconic of all flowers. Kentucky: Goldenrod. The bright yellow flowering plants have represented Kentucky since 1926. Louisiana: Magnolia. Stately and serene, magnolias are a treat for the senses. Magnolia was designated as Louisiana’s state flower in 1900. Maine: White Pine Tassel and Cone. The only state flower that is not really a flower. Maryland: Black-eyed Susan. These perennials are members of the sunflower family. Massachusetts: Mayflower. Its white flowers seem to convey Pilgrim-like purity. Michigan: Apple Blossom. Chosen as an emblem in 1897. Michigan is still a major apple grower today. Minnesota: Pink and White Ladyslipper. One of 43 orchid species that grow in Minnesota. Mississippi: Magnolia. The flower received its official designation in 1952. Missouri: Hawthorn. The beautiful white flower of the hawthorn tree was selected as state flower in 1923. Montana: Bitterroot. Long used by Native Americans, the plant was brought to wider fame by explorers Lewis and Clark. Nebraska: Goldenrod. The state’s floral symbol since 1895. Nevada: Sagebrush. An ideal choice for the Sagebrush State. New Hampshire: Purple Lilac. According to historian Leon Anderson, purple lilac reflects the hardy nature of those in the Granite State. New Jersey: Violet. Officially designated in 1971. New Mexico: Yucca. Also known as “Lamparas de dios” (Lamps of the Lord) because of its brilliant white flowers. New York: Rose. Named state flower in 1955. North Carolina: Flowering Dogwood. Selected from a number of other flowers, the delicate white blossom won the title in 1941. North Dakota: Wild Prairie Rose. Officially designated in 1907. Ohio: Scarlet Carnation. Among the most resilient and sturdiest of flowers. Oklahoma: Mistletoe. Steeped in lore, the mistletoe in this case evokes the endurance of those who settled the land. Oregon: Oregon Grape. A glorious yellow-flowered plant that’s native to the Pacific Coast. Pennsylvania: Mountain Laurel. The governor chose this pink and white bloom in 1933. Rhode Island: Violet. Officially designated in 1968. South Carolina: Yellow Jessamine. Fragrant and fertile, it grows abundantly throughout the state. South Dakota: Pasque Flower. Part of the buttercup family and a harbinger of spring. Tennessee: Iris. Said to represent faith, valor and wisdom. Texas: Texas Bluebonnet. Wildflowers with rich captivating color. Utah: Sego Lily. Its beauty is both simple and exotic. Vermont: Red Clover. A bright and cheerful floral symbol. Virginia: Flowering Dogwood. Officially designated in 1918. Washington: Coast Rhododendron. Lush and lovely, the flower gets its name from the Greek words for rose (rhodos) and tree (dendron). Picked in 1892. West Virginia: Rhododendron. Adopted in 1903. Wisconsin: Violet. Selected in 1909, it was not officially designated until 1949. Wyoming: Indian Paintbrush. This vibrant perennial grows in many western states.